Welcome back to Monday Motivation! 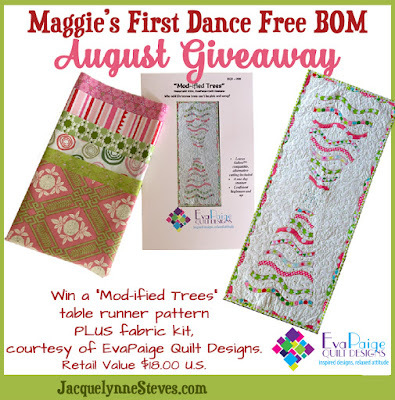 I cannot believe we are already on Block 3 for Maggie's First Dance by Jacquelynne Steves. Hope everyone is having as much fun as I am creating these beautiful blocks! For the free Block of the Month pattern, please visit Jacquelynne's website for sign up information. I continued with the thread painting as with Block One and Block Two. These are the Aurifil 50 wt colors that I used for this block. The 50wt is really very nice when thread painting. You can go over areas many times and it remains very flat and also does not clog up the machine or break. Pretty amazing! The amazing giveaway this month is from Eva Paige Quilt Design! This giveaway is open internationally! The giveaway is open until 07 August and a random winner will be chosen and contacted on or about 09 August. If you are a no reply blogger, please leave your contact information in your comment. To enter for your chance to win this prize is easy! Please share your favorite summer memory in a comment! Also, If you have not entered to win my FABULOUS 50th Birthday Giveaway...TODAY IS THE LAST DAY! GO NOW to enter for your chance to win! Can't wait to get started on the 3rd block! My favorite summer memory is taking my two little boys to the beach-they screamed at first, then wiggled their toes in the wet sand & built a sand castle. They were not ready to go home, finally with a promise to come back, they agreed. Happy memory for ever! my favorite summer memories are of gardening with my mom. My favorite summer memories are the walks I take with my husband. My favorite summer memories are the vacations with my husband over the last 25 years. One of my favourite summer memories is a houseboat vacation on the Shuswap Lakes in British Columbia. It was very relaxing! There was a slide into the water off of the upper deck. Each night we would beach the boat and have a campfire. My favourite summertime memory was a family camping trip to the East Coast!! We enjoyed ourselves so much that we went back two years later!! fishing at a river bank and roasting marshmallows over the bonfire. My favorite summer memories were from a long time ago. The year I graduated high school and all my friends who worked together went to the beach almost every day. It was such a happy carefree time in my life. My favorite summer memories are from the many summer weekends we spent at my grandparents cabin on the water. The one I remember most is when we visited their neighbors and got to ride their horses. Great fun for a 10 year old! Super thread painting, do you use the same colour in the bobbin, or a clear monofilament? My favourite summer memory, was when we were staying in a very tiny bach, it was 8 feet by 10 feet, and was Christmas, here in NZ that is summertime, but that year, was a bit cold, so we had soup and toast for our meal that night.This was in about 1974!!! My favorite summer memories are the weekends my family spend at our lake cottage. I really love thread painting details on my projects so I was very interested in your use of thread painting. Wonderful block! Thanks for sharing. We haven't done a summer vacation as yet - planning to head to Chattanooga in September for Quilt Week and visiting with family. Childhood summers were always long and sunny weren't they??? Camping and going to the beach. Lots of great summer memories here! My favorite summer was 1983 when I graduated from college in May and married my sweetheart in August! This week, we will celebrate 33 years together. That summer, we also bought our first house and moved in just a week after we married. My favorite summer~ When my babies were small and watching them play out in the summer sun, feeding chickens and loving each other! A summer trip to Ireland and Scotland is the best memory. So beautiful block.One of my best summer memory is going to the beach with my brothers and sisters,we rent a large house and spend one with together.Reminds me Christmas Eve. I enjoy seeing your thread painting each month, you do such a great job. My favorite summer memory is laying in the shade of a tree and looking at the beautiful blue sky. That is probably why blue is my favorite color. My favorite summer memories are swimming and riding horses. One of my favorite summers was a surprise birthday party when I was 12. I grew up in hot Kansas with no AC. The best part was cold watermelon and ice cream cones. Sunday picnics at my grandmothers w/ all my cousins! Playing cards all day on the back porch with my sister. Having picnics in nearby state parks. My summer memory is playing in the neighborhood with friends! My favorite summer memory is my daughter's July 5 birthday every year. I can't believe how fast she is growing up. My favorite summer memory is taking the kids to Chincoteague Island in Virginia for a week of family fun! My favorite summer memories are camping trips with family. I love your blog, it is so full of inspiration! I loved spending days at my grandparent's Summer bungalow. There was a main house, and the bungalow, and lots of property in between. All my cousins would come, and we'd play flashlight tag, and have BBQs, and go to the beach, and the lake and canoe, and ride bikes, and just have fun. I also loved camping with my family, and exploring the US. Great block! I loved visiting Salt Lake City and Yellowstone National Park 2 years ago. I need to plan a trip like that again! My favorite summer memory was visiting my grandma Stevenson and watching her make quilts on a frame with no machine. She promised to teach me how but died before she could. My favorite summer memory was when I was a child going to the shore to dig clams, and have a bonfire on the beach. Favorite summer memory is sleeping outside. I am still trying to build more memories of fun summers with my kids. One of my favorites would be on the gulf coast in Florida and hunting for sand dollars and shells. The kids always love the beach. Each year we take our grandboys on a 2 day vacation. They are just 7 and 10 and the world is amazing through their eyes. My favorite summer memory is vacationing on the shores of Lake Superior in Michigan's upper peninsular. Birthday parties for my son's with all the family. We would swim in the pool and play a wild game of whiffle ball. Love the colors in your block! My birthday is in the summer, so my favorite memories are of the fun birthday parties I had as a kid. We would play games in the yard and eat cake and ice cream on a kid sized picnic table. Those were the days! Summer time e is time with family and grandkids. Vacation in Sequoia national park for a week with my family. I was in my early 22 and my four sisters and i and parents had a blast and adventures in cooking hiking ice cold creeks and bears. My favorite summer memory was camping with my family as a child. I remember our favorite campground in Tennessee like it was yesterday. My dad and his buddy would sing around the campfire, and always drew a crowd. My favorite summer memory was when we took our Missionette Girls group on a camp out and for the first time they helped me reach a goal to walk up to the falls where we were staying at Nambe Falls, New Mexico. I have a fear of heights but they talked me through it and I got to see the falls. Going to my grandma's house and laying on the porch swing listening to the birds. My favorite summer memory was going to Disney land with my Mom and little brother. I still think of that vacation often, it was a dream come true! My favorite summer memory is any of the vacations spent with my daughters and husband exploring national parks. I think my favorite summer memory is when my oldest daughter was 18 months and we went to South Dakota to visit my grandparents. I was a wonderful visit and, unfortunately, the last time I got to see my grandmother. I thank the Lord I got to see her then. Vacationing in the cool mountains. Visiting Grandpa and Grandma in Kansas. Grandpa made a huge tent in the backyard using ladders and taros. He even put overstuffed furniture out there for us kids--my sisters, cousins and me. We made hand cranked ice cream and ate big slices of ice cold watermelon and spit the seeds. Summer is when my first baby was born. It also reminds me of when Koolaid was the drink of choice, and bologna sandwiches were a staple in our diet. Such memories! Summers visiting grandparents and cousins. It's a toss up between reading books outside and catching fireflies. My favorite summer memory is when my husband and I got married! My favorite summer memories are of the ice cream truck! My favorite summer memory is going to the beach with my brother. We grew up in California and Dockwieler Beach was just a short bus ride away. Mom would pack us a lunch and we would grab our towels and set off for a day of sand and surf. So much fun. My favorite summer memory is walking along the shore at low tide and checking out tide pools and then as the water comes over the hot sand floating. I remember going to the beach with my children when they were small. It was always a wonderful way to spend time together! Playing in my outside "kitchen" making mud pies. My favorite summer moment was helping my granddaughter Victoria piece a king size quilt top for her bedroom. My daughter did the pressing, Victoria did the sewing and I did the cutting. It went together so fast! Favorite summer memory was visiting my husband when he was working in Rochester NY and visiting the Falls and riding on the Maid of the Mist under the falls. Getting to travel by car from Kentucky to Washington State, down the Oregon coast to the Redwood National Forrest across California to Reno and back to Kentucky through Colorado, Kansas and Missouri. We saw so many beautiful sights. We truly live in a wonderful country. My favorite summer memory is summer church camp. My grandma and I shared a room for the week. We always had a great time. Gram & I were very close. I loved her so. MY favorite summer memories are of spending summers with my grandparents. They lived on a lake and I got to swim everyday. Loved it! Some of my favorite memories are the ones made with my littles playing on the beach. My favourite memory is camping with my family as a kid. We travelled to a different place each year. I always loved running through the sprinkler on a hot summer day. My favourite summer memories are all summer long camping with my children. Their favourite days were upside down days .... Starting with supper and ending with breakfast! With sea swimming in between. Such happy days. My favorite summer memories are Bible camp. Growing up in the suburbs of Chicago, it was so much fun to go to Wisconsin and go to summer camp. All of the outer door activities, the lake, the camp fires and the Bible lessons were fantastic and I loved every minute of it. Hmmm...I have lots of great summer memories, having grown up by the beach. But some of my earliest are from when we were very little and could see the Disneyland fireworks from our front lawn. All the moms on our block had the same rule: once the fireworks were over, it was time to come in and go to bed. That practically guaranteed sweet dreams. My favorite summer memory was when all 4 of my children can home at the same time. My kids are spread out in all four corners of the US so it very unusual for everyone to get together at the same time. Family time is to be cherished. My favorite summer memories are of bicycling. Riding along quite country roads with no timetable, enjoying the fresh air and wildlife. My first grandbaby🤗🤗🤗👏🏻. MUST make her a quilt!!!!!! My favorite summer memory is having our grandchildren here for a week and all the fun we had together. Priceless! My favorite moment this summer is being on vacation this week in Orlando, Florida with my older sister, my younger sister and her husband, my nephew and his wife and their two kids. Weekends at the Grandparents farm . Swimming in the pond, fried chicken supper and when in season morel mushroom picking in the woods. My favorite summer memory has been camping with my family!! My favorite summer memories are from this year. We went to Germany for two weeks to stay with the family of our foreign exchange daughter and it was a wonderful, magical experience. My favorite summer memory is staying at my grandparent's home for several weeks with my sister. Nana had an old 3 story farm house with 2 barns, lots of gardens and trees, and unlimited fabric. I started sewing at a very young age! Oh, it was a summer vacation with my family camping in Jackson Hole, WY. We took a month traveling there and back visiting the Grand Canyon, Bryce, and Zion canyons on the way. I remember one night watching shooting stars streak across the sky. One of my most favorite memories of summer was a family visit to Mt. Rushmore as a kid. I was in awe. Now that I am an adult, I would love to go back for a visit. Take my husband. He has never been. I tell him pictures don't do it justice. You must be standing on the patio looking up at it to feel what a beautiful monument this artist has built! It's an awesome feeling! My favorite summer memory is visiting our rustic (only the fireplace and a woodstove in the kitchen for heat), beach cabin in Gearhart, Oregon when I was growing up. So many great times! My favorite summer memory is this year (short memory), staying in out of the heat and working on a quilt. While it is summer here where i live we went home to escape the heatwaves. Back home since it was another country it was monsoons and we love rain. getting wet in the rain, walking in umbrellas, waddling in the stream is my favorite memory with my children. I always loved staying at my Grandparents for the week when I was young. There was a little girl about my age who lived beside them and we did all the childhood fun things like making mud pies. My Grandparents lived in the country. We would also collect lightening bugs and she would give me one of her Anacin bottles to put them in. I also remember catching tiny frogs in the field by her house, and putting them in coke bottles. My favorite summer memory is the family trip from Michigan to Minnesota to my grandparents' small farm. We could explore, visit the barn and animals, went fishing and swimming in the small lake and had picnics with all the relatives who came. Living in WV, I spent many a summer day at and in a river in the woods. Such cold water on what we considered a hot day at 85 degrees. Good times! Best summer memory, going to Disney world. My son was a Make a Wish child. For a few days we were just a normal family going on vacation. My grandchildren took turns visiting us for 6 weeks this summer and my favorite memory is when my husband and I, along with my oldest daughter, took them all to Silver Springs for a ride on the glass bottom boat and had a picnic afterward. I love your color choices. My favorite summers were when I married my husband and we went to Pacific Northwest for honeymoon--a real treat from the Texas heat! Then our son was born in 1980, which hit all records for heat...but I didn't care, he was my first baby! New to florida and really enjoying our time on the ocean, boating and snorkeling. When I was about 15 (almost 55 years ago), I loved to sneak out and lay on an old driveway in our backyard and look at the stars. Going to visit my grandma! My fav summer memory was goin to visit and stay with my mamaw and papaw at there house. Miss them so much. Miss the good ole days. Seeing my grandchildren suddenly get confidence and blossom in an area. My 5 yr old has been clinging to the side of the pool in the past months, but she started clinging to the sides of the 6 ft area. Then I sent her to a week of camp in our neighborhood with other children. I went to pick her up the second day and she was standing on the end of the diving board, over the 10 foot water, and she jumped in, then swam to the ladder. My mouth dropped and didn't close. She did it again, and again. I texted her parents.....You won't believe what Elizabeth just did!! I was so proud of her. Lifeguards were nearby, yes. It's like she held this secret and then she let it out. Favorite memory of when I was little and going each summer on the family vacation. My father had fun planning it all cold winter. My favorite summer memories are of traveling (moving, actually) cross country last year with my two grown children and our two animals.... We had a great time! My favorite summer memory is spending the day with my family at the Indiana State Dunes. So much fun! Visiting with grandchildren. Two of them stayed with us at our cabin. My favorite memory is a vacation we took with all 3 kids to California, we drove and got to see lots of sites..
My favourite memory is the long break from school and curling up with books! My favorite summer memories were family clamboils when we were kids. Lots of work for the adults but I think everyone enjoyed them. Loved tent camping when my kids were little! Camping with family, cabin rentals on Travis City bay as a kid so fun! So sorry Zi missed your Birthday, and your drawings... I can't keep up with all the designers and their seperate pages!! It is sad... I wish their had been a special one place to see the going ins and events and drawings!! Happy 60yj Birthday Jacquelynne Steves. Thanks for all you do! Thanks for your block and free things! The first year we got our camper we rambled all summer. Had a wonderful family summer.